One of my close friends, Tina, has been trying to get pregnant for several months...after enduring the loss of a miscarriage. Since I haven't gone through these situations myself, I can only imagine what she is experiencing, but I would anticipate that in addition to the loss and frustration of not being able to get pregnant, there may also be a sense of being alone, and possibly continually asking the question, "Why?" Of which there may not ever be an adequate response. Last weekend I got an intuitive hit to pull together a tarot spread and an affirmation to help open the energy for my friend to conceive. Since other people (and some WW readers) are dealing with infertility, I wanted to share this with you here. For my friend, Tina, I'd like to select a couple of tarot cards and provide an affirmation to use as you move through this waiting time. I referenced Renee's book to create this spread, but also personalized this message for Tina. 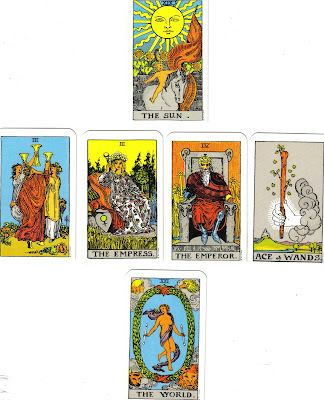 The cards I pulled are The Sun, the Three of Cups, The Empress, The Emperor, the Ace of Wands and The World. The Sun is a card of opportunity, success, joy and fulfillment. This covers you, your husband and your family. The Three of Cups, which is about coming together for celebrating and enjoying good times. It can also symbolize conception, gestation, pregnancy and birth. The Empress (and click here) and Emperor are the archetypal parental symbols in the deck. The Empress symbolizes powerful female energy, motherhood and fertility. The Emperor is the most powerful male energy in the deck and complements the Empress as they are father and mother, husband and wife. The Ace of Wands symbolizes birth, new life, virility, procreation, success in a new venture and sexual passion. The energy of The World supports you and your family.This is a card of attainment, harmony, fulfillment and a culmination of your efforts. 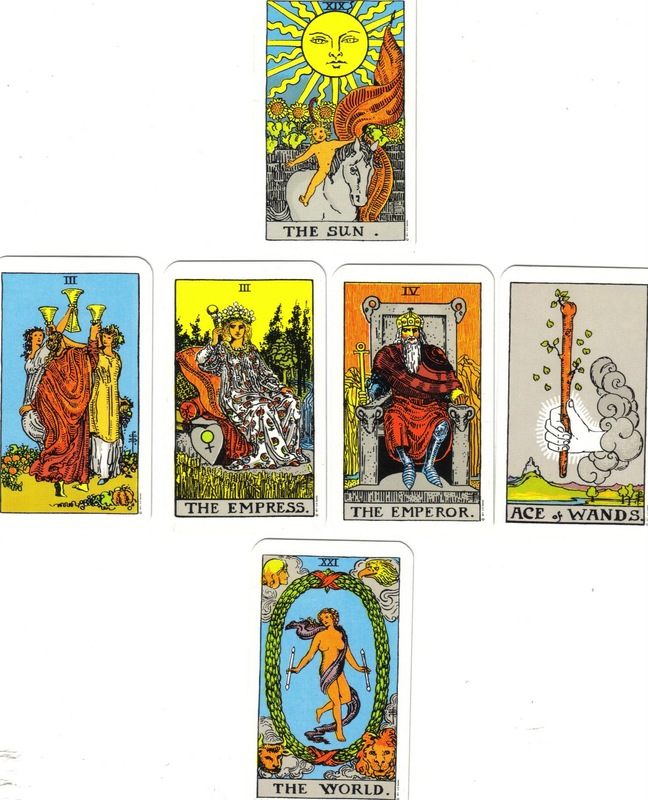 To use these cards to summons this energy, sort through your tarot deck (or use the graphic provided above) and layout the cards mentioned above. Feel free to substitute cards that you feel more accurately represent you and your situation. Layout the selected cards and ground yourself by closing your eyes and taking ten deep breaths. Then open your eyes and say the following affirmation (again know that you can change the words in the affirmation to personalize it to fit your situation. The more personal this feels, the more powerful it will be). intentions known to the universe. to welcome into my/our life/lives. And know that there is complete order in the universe. May you find peace in your heart as you layout your cards and repeat this affirmation. What an absolutely beautiful thing tho do for your friend. "And know that there is complete order in the universe." Beautiful spread. May it bring peace and flow (not aunt) to Tina. And others. Oh, Sheri, I LOVE this so much!! Thank you - what a great gift to Tina and to all of us who are praying and hoping! You are truly a special person Sheri. Your friends are blessed to have you!